Scenes like this are becoming less common around Oswego in recent years. OSWEGO, NY – For several years, the Port City wore the title “Snow King” like a crown. But, in recent years, that is a designation that has relentlessly melted. 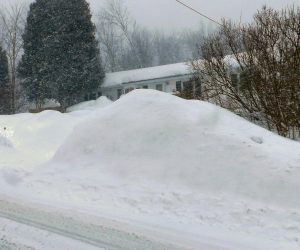 While areas further north and east of Lake Ontario have been bombarded by mountains of snowfall this winter, Oswego hadn’t even received 45 inches by New Year’s Eve. As of Jan. 13 the season’s total is just 56.9 inches, according to Bill Gregway, local observer for the National Weather Service. The decline in Oswego’s snowfall was recently documented by the NWS, which records 30-year averages for snowfall. Previously, Oswego was at 150.8 inches per winter. According to the new figures released by the NWS, Oswego’s average has dwindled nearly 10 inches to 141.0 inches. There have been 61 times (66, actually – there were five ties) when Oswego’s snowfall came in at 100 inches or less for the winter. In 1935-36 it was exactly 100 inches. And, three others came very close. In 1900-01 the total was 99.8 inches; in 1994-95 it was 99.5 inches; and in 1959-60 it was exactly 99 inches. At the lower end of the spectrum, there are four winters whose snowfalls were in the 40-something inches range. The least snowiest winter on record for the Port City is 1885-86. That winter received just 29.4 inches of snow. Snowfall totals less than 100 inches haven’t been that uncommon in recent years. We have missed the century mark in 1999-2000 (76.6), 2001-2002 (70.6), 2011-2012 (70.8) and 2015-2016 (80.3). • On Jan. 13, 2012, there was 13.2 inches of snow and 22.7 inches for the winter. The winter ended with 70.8 inches. • On Jan. 13, 2013, there was 5.5 inches of snow and 40.4 inches for the winter. The winter ended with 140.3 inches. • On Jan. 13, 2014, there was 23.6 inches of snow and 62.9 inches for the winter. The winter ended with 154.5 inches. • On Jan. 13, 2015, there was 23.0 inches of snow and 65.3 inches for the winter. The winter ended with 144.0 inches. • On Jan. 13, 2016, there was 13.0 inches of snow and 23.6 inches for the winter. The winter ended with 80.3 inches. With just more than two months left in this winter, it’s anyone’s guess how much more snow will fall. But it’s not looking good for reaching 100 inches. Oswego City probably won’t miss the record at all. It was fun to hear our name mentioned on the Johnny Carson Show, and made fun of in cartoons and even by I think Bob Hope back in the day. But most of us like the new weather. But agreed, this isn’t normal for us, and what’s happening in other parts of the world. SNOW in ATLANTA?? ?